ELTÉ was once a well-known and well-respected manufacturer of boules. In fact, along with JB, it was one of the original manufacturers of all-steel boules. Behind these two brands — LT and JB — were two remarkable men — Louis Tarchier and Jean Blanc. By some accounts it was the Great Depression of 1929 that stimulated Louis Tarchier and Jean Blanc to go into business for themselves, and to develop the all-steel boule. But the dates just don’t work for that story. The evidence is that they had been working on their process since perhaps 1925, and produced their first boules in 1927 or 1928. It is more probable that their inspiration was the development by Paul Courtieu of La Boule Intégrale, the first all-metal boule (cast in one piece from a “bronze” copper-aluminum alloy). 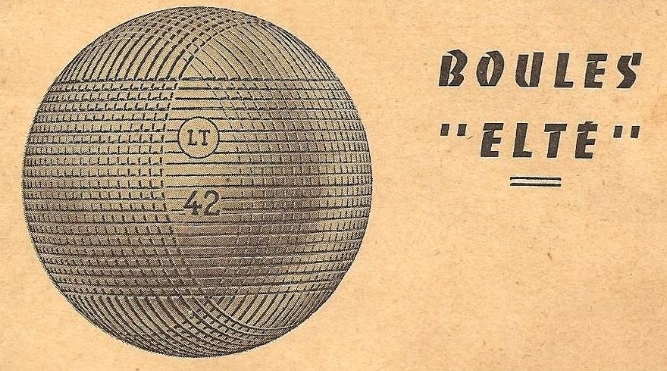 Specifically, it seems likely that it was the approval of La Boule Intégrale by the Union Nationale des Fédérations de Boules in January 1925 that suggested to Tarchier and Blanc that there might be a market for an all-steel boule. What we do know is that a man named Louis Tarchier, a gunsmith, and his friend and neighbor, Jean Blanc, a locksmith, lived in the little village of Saint-Bonnet-le-Château, and that sometime around 1925 Blanc came up with the idea that the two of them should go into business making metal boules. Between the two of them they had the necessary skills and the necessary equipment. Blanc owned a metal press. Tarchier was one of the few specialists in the new technology of welding and cutting metal with an acetylene torch. They designed a manufacturing process, and invented and built the machines to do the various manufacturing steps. Blanc made the punches and dies to stamp steel blanks into hemispheres. The manufacturing process was divided between the two men. Blanc cut long steel rods into slugs (basically stubby cylinders of steel) and stamped the slugs into disks and then into coquilles (“shells”, hollow hemispheres). Tarchier cut beveled edges into the shells, welded them together to form boules, polished them, and added the striations and markings. When it came time to temper the boules in the forge, Tarchier pumped the bellows and Blanc rotated the boules. This is how boules are made… the process invented by Jean Blanc and Louis Tarchier. A slug is cut off of a bar of steel (acier), pounded into a flat steel disk, and then pounded into a shell (coquille). Two shells are welded (soudre) together to form a sphere, which is then machined into a smooth sphere, after which lines (stries) and engraving are added, and the boule is polished. It took about three hours to manufacture a boule, and in the beginning it was difficult to control the final product. The two had to make boules for several months before they were able to make two of the same weight and the same diameter. Together, they created the first all steel boules. Each man had his own business and sold boules under his own brand name. They created their brand names from their initials. Louis Tarchier created the ELTÉ brand in 1930. Its logo, which was stamped on its boules, was Tarchier’s initials “LT” inside a circle. Jean Blanc created the “JB” brand. In very early JB boules, he also used a logo of his initials “JB” inside a circle. Blanc died in 1933, at the age of 58. Jean Deville purchased the business’s machinery and continued to manufacture boules under the brand name of “JB”. Louis Tarchier continued to manufacture “L.-T.” or ELTÉ boules, most of which were sent to, and sold through, La Boule Intégrale in Lyon. After thirty-three years with the business, Tarchier retired, giving the business to his son-in-law, Maurice Crozet. In 1987 the brand name and the factories were sold (to a company named Opoint? ), and seven years later sold again to OBUT, which retired the ELTÉ brand name. OBUT also bought the JB brand in the 1990s, and retired it in 2012. French wikipedia says Les boules Elté sont des boules artisanales, très différentes des boules produites à la chaîne, et estimées par les professionnels. — Elté boules were “artisanal” (craft, hand-made) boules, very different from mass-manufactured, and held in high esteem by professionals. Most of the information in this post comes from the article on ELTE in the French wikipedia. That article cites only one reference, Jean-Michel Izoird and Gérard Pélisson-Lafay, La Pétanque, éditions ÉdiLoire. Hi, i am french. Very good article. i search informations on the company OPOINT. What is your source of information ? I am very interested to discover the name of the company to buy ELTE in 1987. I hate to say this, but I can’t tell you. I remember clearly that while I was researching this article I found something online that suggested that the name of the company was “Opoint”. But when I tried to find the article again, to verify that fact, I could not do it. That’s why I put the question mark “?” after “Opoint”— to suggest that the company might have been called “Opoint” but I was unable absolutely to confirm that. Thanks vert much for tour response.